After a dramatic weekend of clashes between Islamic State (ISIS) fighters and Kurdish forces, an oilfield in Iraq has been left burning and damaged. As of Monday, service from the oilfield was still halted, potentially putting a dent in revenue from the country’s key export. On Friday, ISIS captured the oilfield in an attack, taking all 20 workers hostage. According to a Reuters report, ISIS seized four small oilfields in northern Iraq last summer, and has been funding its operations by selling crude. But they only held onto this field for one day. On Saturday, Kurdish forces were able to drive ISIS out of the Khabbaz oilfield. It wasn’t until the next day before the oil workers were found. Oil is an immensely important export for Iraq, and the country’s oil business has boomed, despite all the cards being stacked against it. Even with a decline in global crude prices, in December Iraq produced nearly 4 million barrels per day — an all-time high — bringing in cash that the government depends on for 90 percent of its revenues. The country has pledged to further increase output from Kirkuk, the region where this latest siege took place. The Khabbaz station in Kirkuk has a maximum capacity of about 15,000 barrels per day — representing a fraction of the 150,000 barrels per day the region produces. And after new pipelines are built, the government is hoping to increase output from the region to 300,000 barrels a day. But part of that success will hinge on keeping ISIS out. 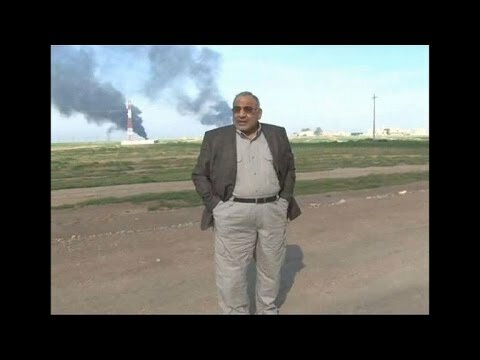 In this video by AFP News Agency, the Iraqi oil minister surveys the burning oil fields.